London in the 1960s and early 1970s was the place to be… the “happening place, man”. Unfortunately, we weren’t there. In spirit maybe, but not in the flesh. 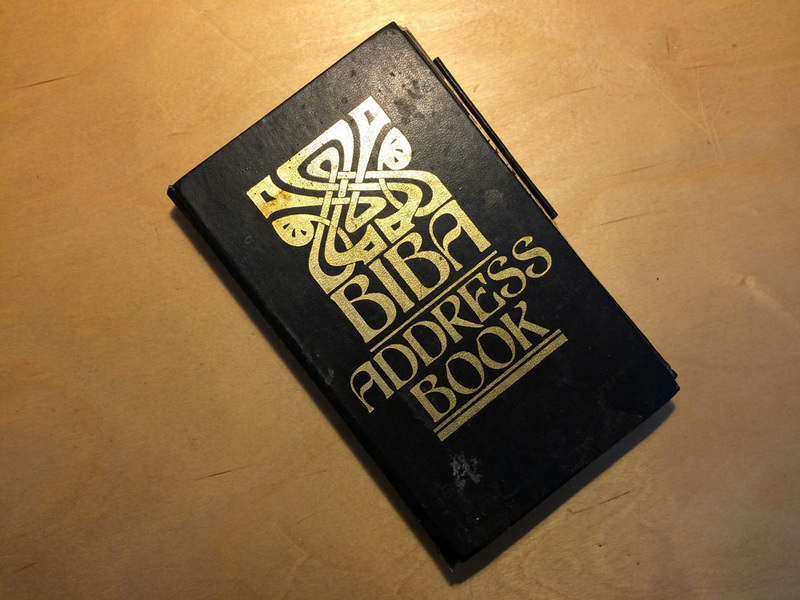 Too busy studying and other stuff, but we did visit the Biba store a couple of times in the early seventies. Fashion and music were the keys and, although the music really took off in Liverpool, London was the fashion capital of the world. Art schools like the Slade, Chelsea Art College and the Royal College were home to young, exciting designers who were changing the tastes of young people starved for so long by the after effects of the war. Young models were thin and waife-like, brought up on a diet which lacked chocolate or any fast foods [fish’n’chips excepted]. People were also starved of readily available fashion and shops were very traditional, men’s clothing often made to measure [and therefore taking forever], and styles based on what your mother wore. No mail order, no internet. The mid-1960s changed all that and in London a fashion and retail revolution was taking place. 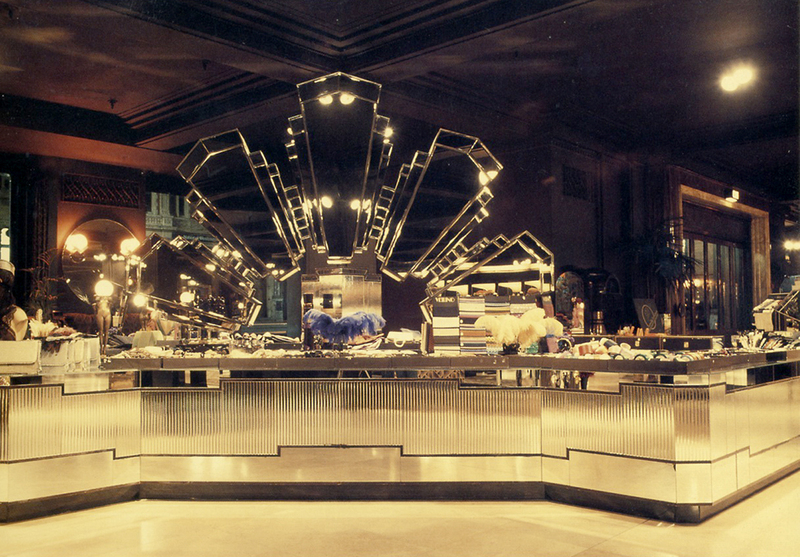 Barbara Hulanicki, a Polish born fashion designer, and her husband Stephen Fitz-Simon, opened the first Biba store in Kensington. It became a hangout for artists, film stars and rock musicians, including Mick Jagger and The Rolling Stones, David Bowie, Marianne Faithfull and Cathy McGowan, presenter of Ready Steady Go!. In the shop affordable mini-skirts, floppy felt hats, feather boas, velvet trouser suits and unisex t-shirts dyed in rich, muted colors were bought by a young clientele. Anna Wintour started in fashion as a Biba employee. 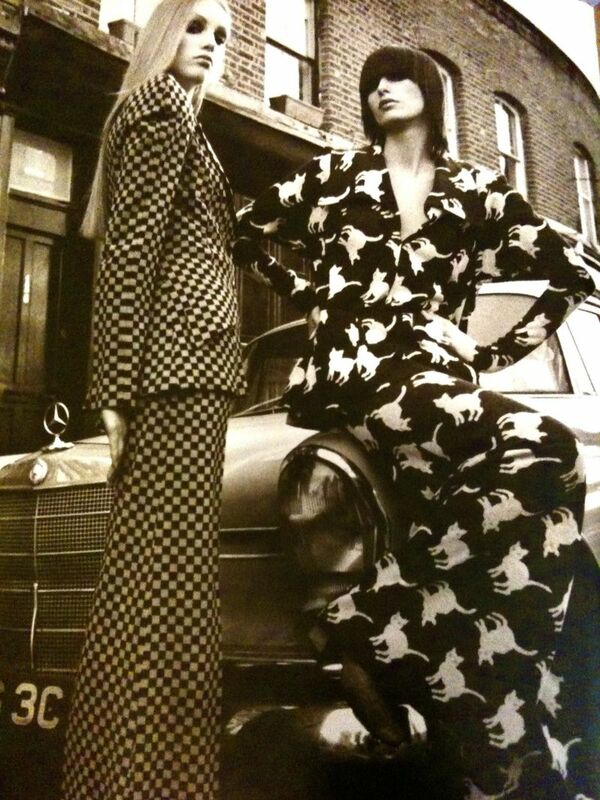 After a small mail order start, and a couple of shops in Abingdon Road and Kensington Church Street, Biba opened a bohemian department store in the old seven storey Derry and Toms building and became the most visited place in London. Rapid success can lead to rapid failure and Biba’s financial problems led to a buy-out and ultimately Barbara left and the store folded. The bit of the Biba store that survived almost intact was the Kensington roof gardens. Claimed at one time to be the largest roof garden in Europe, the gardens were bought by Sir Richard Branson in 1981. In 2001 Babylon Restaurant opened, part of the Richard Branson empire, along side his Safari Lodge, Ski Lodge and Necker island. So thursday night saw a small party gather for a birthday [33+VAT, if you’re asking] in the warm London evening sunshine. We made it despite the Tube strike, walking from Kings Cross to Mayfair, until we could flag down a taxi. 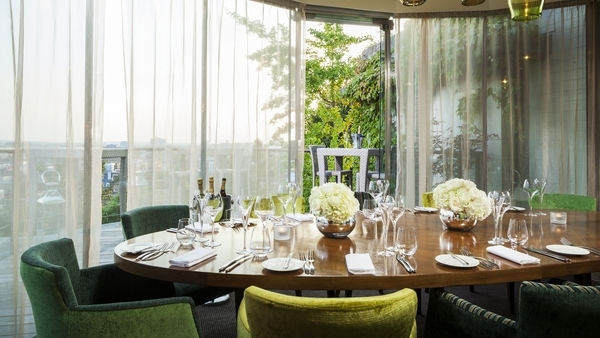 We couldn’t get into the roof gardens – booked for a private party – but we could look down on them from our little private terrace in the restaurant. 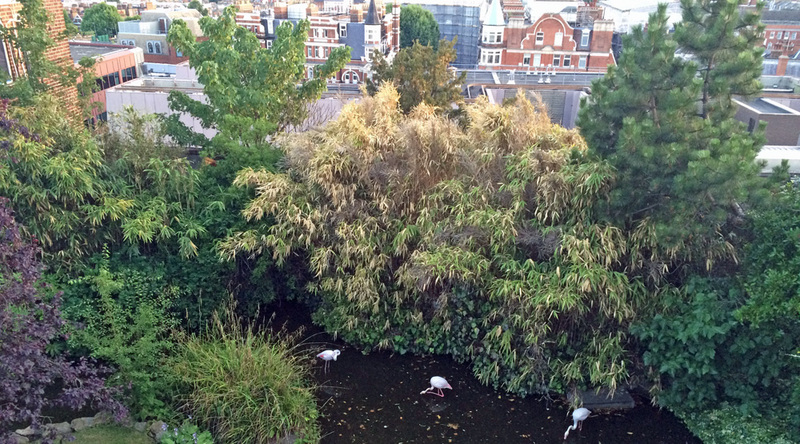 Yes, the flamingoes are really there, with their wings clipped to stop them escaping to sunnier climes, and the vegetation every bit as lush as the photographs suggest. The restaurant works well and the simple but very tasty seasonal menu a delight. Summer Truffle risotto [you could smell the generous helping of truffle as soon as it left the kitchen], Cornish Lamb Loin roasted till pink, rosemary & garlic polenta, peas & broad beans, baby turnip, English asparagus and Madeira jus and, to finish, Lemon Parfait served with a gin & lemon macaroon with honey jelly and lemon verbena. What can I see from Babylon? The best views are from Babylon’s terrace. To the east you can see the City, St. Paul’s, Canary Wharf, and Centre Point. To the south is the National History Museum, Battersea Power Station, Crystal Palace, and to the west you can see Earl’s Court, Kensington Olympia, and Richmond Park. 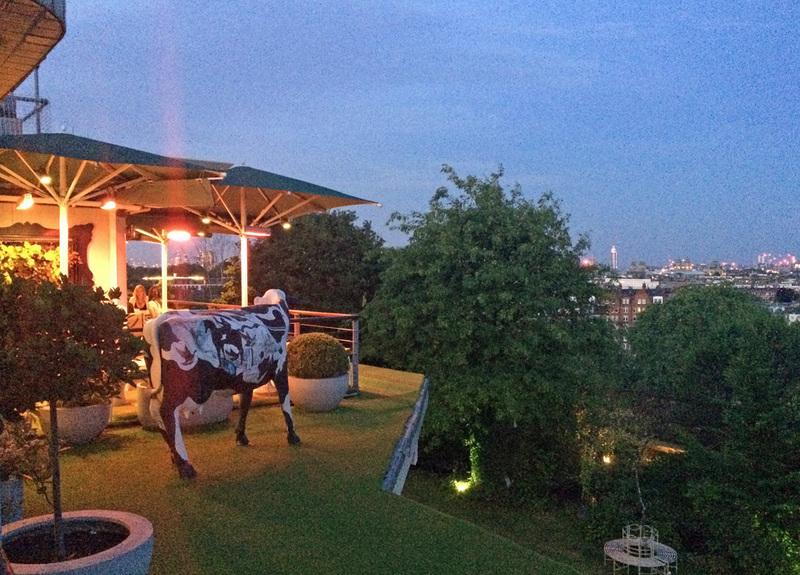 …the restaurant, complete with grass and cow. Gardens below.